680 pages, profusely illustrated with excellent photographs, diagrams, and charts and with extensive 11-page bibliography and index. My experience with both the theoretical and practical knowledge about aquarium husbandry for coral reef animals that Julian Sprung possesses came many years ago at one of the first meetings of MACNA, this one in New Jersey. There, Julian suggested the possibility of keeping what we now call “nanoreefs,” using the live rock method of biological filtration. I had had many years of experience with fresh water aquaria, and I quickly set up a successful ten-gallon marine tank, the first I ever tried. 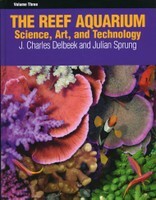 The first book I reviewed for the highly regarded printed edition of Aquarium Frontiers was Delbeek and Sprung’s The Reef Aquarium, Volume One, more than ten years ago, in 1994. At that time it stood as the best single compendium of the basic biology of corals and the techniques for keeping them alive and healthy in the home microreef aquarium. So my reliance on Julian for information and technique goes way back. I came to know Charles later, after he became an aquarist at the Waikiki Aquarium, and close in time to my own move to Hawaii, I came to respect his knowledge equally. They have now released Volume Three of their series, this one is subtitled, “Science, Art and Technology,” in contrast to the previous two, both of which were subtitled “A Comprehensive Guide to the Identification and Care of Tropical Marine Invertebrates.” The change in title indicates a change in direction. Rather than concentrating on particular organisms or groups of organisms, the authors have concentrated on sharing new scientific concepts involved in reefkeeping, the most recent developments in the technology required to support it and the aesthetics of creating spectacular displays. The lengthy “Introduction” contains the author’s thoughts on the ethics and ecological impact of our hobby. They laud the developments in the aquaculture of fishes, corals and other reef invertebrates. At the same time they defend the collection of organisms from the wild, providing it meets two criteria – sustainability of the harvest coupled with economic benefits to local communities. Of course they criticize destructive collection techniques, over-harvesting of rare organisms and exclusion of locals from opportunities. (While I support these concepts, I would rather the focus moved to encouraging poor coastal communities to become more involved in aquaculture.) They also make strong arguments against the release of exotic organisms that have the potential of becoming locally invasive. Chapter One is titled “The Basics of Aquarium Selection and Design.” It covers the pros and cons of glass and acrylic tanks, as well as other options and offers a detailed look at the new methods for the construction of overflows and sumps. It also discusses stand construction and locating the aquarium. The second chapter, “Common Elements,” discusses the fundamentals – natural and artificial seawater, de-polluting make up water, types of live rock and their proper treatment, sand and gravel substrate issues such as grade and particle size as well as depth of the bed and even touches on the use of mud in the substrate. Chapter Three “Plumbing and Electric” is also full of practical advice. The full spectrum of available piping and tubing is discussed in detail as well as techniques for attachment. The authors also provide a comprehensive discussion of bulkheads and their proper installation and of valves and other fittings. The discussion of main pump installation is very thorough, with numerous charts, tables and calculators so as to ensure proper pump selection. The section on electrical matters covers proper set-ups for electrical systems, emergency back-ups, ballast location and chiller selection and hookup. Chapter Four, “Physical and Chemical parameters of Reef Aquarium Water,” contains 68 pages of the most recent research findings available on these topics, as well as techniques for implementation of controls. It starts with controversies over proper temperature parameters, and covers systems of measurement and control, including detailed discussions of recent technologies for heaters and chillers. This section is also illustrated with numerous photographs and useful explanatory charts and diagrams. There are equally detailed discussions of gas exchange, specific gravity, pH and trace and minor elements and supplementation. The fifth chapter, “Calcium, Alkalinity and pH Maintenance” also presents the most recent available research findings on these critical parameters in 50 information packed pages. Of course there are also detailed discussions of measurement and the most recent technologies for control. The authors cover new methods of dosing kalkwasser, types of calcium reactors, balanced two-part supplements – indeed, every available technique for maintaining optimum levels of each variable. This chapter too uses visual aids very effectively. Chapter Six, “Filtration,” includes more than 150 pages on this topic. The major discussion is an update of research knowledge and techniques for biological filtration. These discussions were, to me at least, as exciting as reading an excellent novel! The main sections, in addition to the live sand-live rock theory and practice, are long and thoughtful discussions of Jaubert’s plenum technique and its modifications, the newest techniques for refugium establishment and maintenance along with current research findings on their utility, and a long look at Adey’s turf scrubber technique. There is also discussion of chemical filtration using GAC and new developments using other filtrants. There is also a detailed presentation of protein skimming and the controversies concerning it. The next two chapters cover “Water Motion” and “Lighting,” in more than 120 pages. At the risk of becoming repetitious, these chapters also combine masses of information from the most recent research literature with practical advice and information on the new technologies that are available to achieve desired results. In all these and previous discussions, Delbeek and Sprung do not shy away from discussions of controversies over theories and methods. Chapter Nine, “Aquascaping,” is their contribution to the aesthetics of minireef design, with beautiful photos to illustrate the principals they consider important. There is also their usual comprehensive presentation of practical and innovative techniques for producing the desired effects. The critical issue of “Foods and Feeding” is covered in chapter ten. As an aside, when Terry Siegel visited Hawaii last month, he marveled at how plump the beautiful fish in the schools of tangs and others were. The authors also question the philosophy of the “nutrient poor environment,” given our current state of knowledge concerning biological and other filtration. Their discussion is, as the case in the other sections of the book, filled with information, and excellent visual illustrations of newly available foods and feeding regimes, many of them developed by the aquaculture industry. The last chapter, “Maintenance, Husbandry and Disease Issues,” follows the pattern of the previous chapters – loads of new information based on solid research, especially of coral and fish diseases and treatments, along with new developments in techniques and very useful visual aids. In summary, this volume is enormously valuable, with up-to-the-minute information on everything that you want to know about tweaking your system, problem solving for it and establishing new aquarium systems. Danny Ramirez has made sure the volume is up to the high production standard set by the previous two, and it will make not only a useful but also a handsome addition to the marine aquarist’s bookshelf. This book is a “must have” for any serious aquarist.